Welcome to 2015 and I raise my glass to all fellow Brood War fans Terrans fans out there. Let us all rejoice as we look towards the bright future that awaits Brood War this year, with two epic Starleagues started, a third on the way and foreign Brood War hopefully undergoing a small resurrection of its own with the Defiler Tours back in action and new organizers taking over their predecessors. This day is also well suited for a trip down memory lane with a glass of whiskey in hand and with that we will use the opportunity to take a closer look back at the Reunion Tournament which was brought to us by Artanis[Xp] four months ago. How much do you remember from the games? Are you a starry-eyed nostalgic when it comes to old games or are your memories darker than they should be? Just take a brief look at the recapped games below, pick whichever one rings a bell and see for yourself! Or, if you want to jump straight into games, take a look at the staff awards for some recommended(?) VODs and replays. First of all, however, watch Retuh's amazing movie below! Then rewatch it a few times more. As if the amazing Reunion Tournament was not enough, Artanis decided to host a King of the Hell event sponsored by SilkyGoose. In this event, Oldschool players would duke it out against a lineup of then active players for a total of €60 prizepool, although to at least some players, defending their pride seemed to have been a much stronger motive. With the first day of the main event over, many people were curious to see just how well would the oldschool players fair against the currently active ones. The pre-game interviews hyped up the games even more, but it was all about to go horribly wrong. Let's not skip ahead though! Before the King of the Hill itself could begin, a micro tournament was held to decide the play order of players. To noone's disbelief, Sziky would be up first for the "Newschool", facing none other than ClouD aka LenisPong. The map was Tau Cross and it saw the veteran Cloud spawn at the nine o'clock and our superstar Sziky at the five o'clock. Both players opened rather standardly; ClouD forge-fast expanded with a stargate into citadel and early +1 weapons, whereas Sziky went with a close third with a spire into five hatch hydra. Neither player started with a scouting advantage and upon scouting Sziky's base, the initial corsair managed to just barely dodge the first pair of scourge. While the scourge seemed to give up the pursuit, they turned for the main where they caught the second corsair right as it was popping out of the stargate with no cannon for cover. Not quite the first flight little Anakin Cloudwalker envisioned. Szebulba used his other pair of scourge to get a thorough scout off and he would have probably been happy with just that, but he even managed to lure the other corsair out of cannon range. Perhaps the two corsair snipes prompted Sziky to do a delayed switch into mutalisk and as if ClouD was thinking of just that, he warped a cannon in each of his mineral lines, while going up to five gateways. With the cannons and and an archon merged, ClouD seemed quite prepared for what would soon come. He decided to march into Sziky's third base with his five +1 speedlots, but ran into sunkens and mutalisks. Questionably, he ordered his zealots to retreat back to his main while losing four to the chasing mutalisk flock, not delaying their reign of terror at all. Sziky manouvered them over the very advantageous cliff behind ClouD's natural expansion. The Italian had already warped in three cannons there, but his simcity failed him. Just getting a single archon through the cannons and probes to the mineral line proved to be a challenge. If Zerg opens with mutalisks, high templar are of little use, as their Storm can be escaped by the airborne units relatively easily. Instead, archons are used to counter clumps of mutalisks. ClouD doing it by the book. While another archon observed from afar, the archon in the front line was being mocked by Sziky's mutalisks. ClouD set up a trap, merging his third archon far from cannon range and Sziky's mutalisks took the bait... A storm landed, catching only one of the mutalisks and unfortunately sealing the archon's fate in the process. 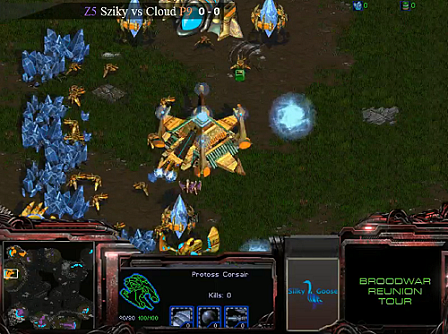 With nothing to hold back the incoming wave of hydralisks, ClouD had to tap out of the game. Sziky's next challenger, TT1, picked Destination as the battlefield. After the first two games, odds seemed grim for the veterans, so a first handicap was about to be introduced. Artanis asked Sziky to send one of his initial drones to scout and not return, but TT1 asked for a straight-up game. Sziky had plans of his own though. Or did he misunderstand? TT1, spawning at the top, opened FFE into +1 sairs and +1 speedlots. He had to deal with a ling runby that made it up his ramp, only getting two probe kills but hurting Protoss' mining severely, evening out the initial handicap. 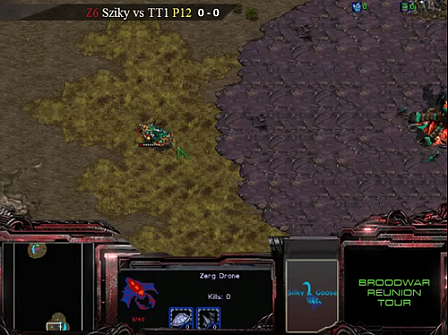 Much like ClouD, TT1 lost one of his scouting corsairs to scourge and would end up facing Sziky's 3 hatch mutalisks. But not before another deadly runby and a snipe of the natural assimilator hurting his economy and focus. The scary looking runby didn't actually end up doing much damage, TT1 was on top of things and managed to somewhat harass Sziky with random zealots. Investing gas into corsairs and zealot upgrades and getting his natural gas denied on top of that, his only way of dealing with the mutalisk threat was to sacrifice his zealots. That worked, but unfortunately, due to some undecisiveness and Sziky's superior drone drilling, the attack failed to do any direct damage, while it had the potential to at least snipe the spire. TT1 tried the same zealot tactic to keep the mutalisks busy soon after, but Sziky could then already rely on his home defences. Meanwhile, Sziky wreaked havoc in the Protoss territory, devouring corsairs, cannons, probes, templar archives, two high templars and TT1's third base. Swarm gathers to enjoy renowned Protoss fireworks. 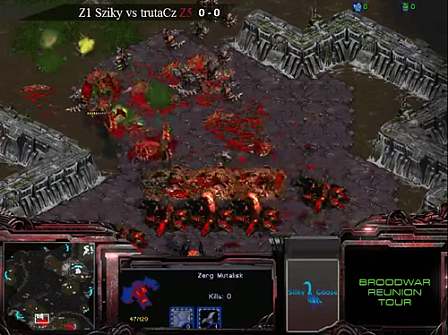 TT1 still kept up his production and his zealot heavy army faired decently against the incoming hydralisks, but it eventually evaporated under Sziky's merciless production rally. The final game of the event, and what would become one of the highlights of foreign ZvZ in 2014, saw one of the few foreigners able to keep up with Sziky, trutaCz, spawn in the bottom base of Tau Cross and open with a twelve pool. Sziky in the top meanwhile opened with a twelve hatch with just enough gas for zergling speed and after defending his natural hatchery, added two more hatcheries, looking to put massive pressure on the Polish ladder monster and possibly end the game then and there. 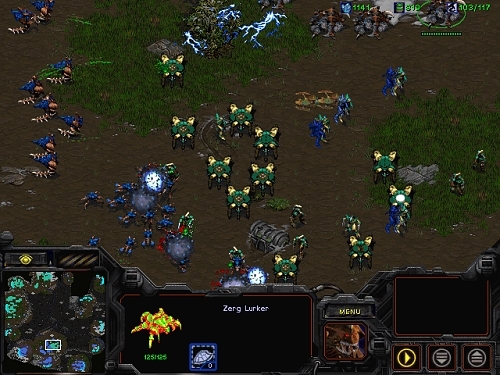 Seeing the incoming speedlings with an overlord, trutaCz morphed two sunkens in time and while one of the sunkens fell, he held the zerglings back rather comfortably. Sziky's magic control failed him this time. Seeing the great sunken/ling arch positioning, Sziky still went in for the attack. With trutaCz's spire done, Sziky focused on drone production with an evolution chamber for spores - if you think you know where this is going, don't get your hopes up just yet. Instead of teching to lair to keep up with his opponent, Sziky continued his speedling agression, getting a few drone snipes, but with no critical mistake for either player and trutaCz's mutalisk count rising, he would have to adapt - with the "standard" switch to... hydralisks, of course. With Sziky's hydralisks out on the map pretty soon, trutaCz had to sacrifice some of his mutalisks to buy extra time for his sunken wall. But as it turned out, Sziky never intended to bust the natural, he merely aimed to force the defences and retreated while droning heavily. Realizing this, trutaCz managed to find an opening in Sziky's natural, getting a few drones for free and not leaving while strengthening his sunken wall back home. He wanted Sziky to suicide into the wall badly, and the Hungarian granted him the wish. With intense muta on hydralisk action, frequent ling backstabs and still no lair tech for Sziky, the low eco game carried on, resembling more and more a wraith TvZ rather than the regular flow of the matchup. trutaCz kept trading mutalisks for drones but with Sziky's hydralisk count steadily rising, he knew he'd soon be susceptible to another counter-attack. And much like the last time, he was ready for it. Yet, trutaCz had overreacted and with this successful defence, he actually put himself behind in the game. trutaCz losing most of his mutalisks with seven sunkens virtually untouched. ...only to learn that Sziky has meanwhile been setting up a ninja base at the nine o'clock main that has already been well fortified with spores. Sziky's advantage was eventually too great to overcome and despite the great tactical play and solid micro from trutaCz, the Polish had no way of securing a third base and had to tap out. And just like that, Sziky ruined yet another event, never leaving the throne and taking the 60€ prize with seven kills, but not failing to deliver great, fun games in the process. 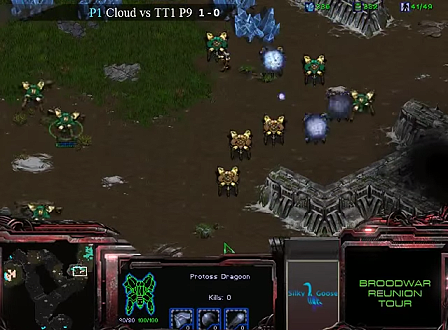 The second game in the first casted series of the quarterfinal had ClouD spawn in the top right base and Mondragon in the bottom base on Tau Cross. ClouD scouted Mondragon first and killing a drone in the natural choke of his adversary, threw down a pylon to block the natural choke. While Mondragon had a drone out in the natural, he GG'd right then and there in the shortest game of the tournament. 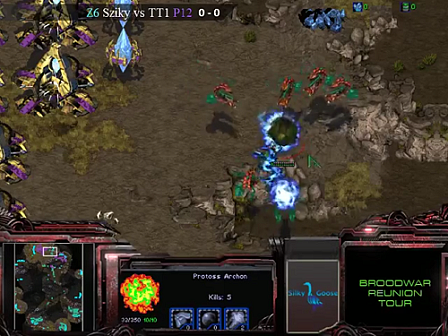 The opening game of the this quarterfinal match-up had MaNa spawn at the top of Destination, sending an early probe for harass and scouting. With nothing of particular notice in SarenS' base, who was executing a standard siege-expand opening, MaNa opened with a one gate robo expansion. Through solid dragoon micro, MaNa traded two dragoons for two tanks and a marine, and progressed to five gateways and a third base to the right. SarenS' vulture drop was countered with ridiculously well timed cannons that finished morphing just as the vultures arrived to the exposed mineral lines. SarenS' third base was delayed by agressive MaNa's shuttles and setting up a fourth at the back mineral-only, Protoss was slowly pulling ahead with arbiters on the way. Growing impatient of the passive Terran, MaNa used his first stasis to bother the Terran defences and managed to get a decent engagement with storm. While SarenS didn't seem to do much in the game, his macro was still very solid in contrast to MaNa's which would float a lot of resources while queuing units in gateways. That was of little help to SarenS when this happened. MaNa recalled the base and stasised Terran units on the ramp, buying enough time to deal significant damage and burn down some of the production structures. SarenS was soon to be on just a single mining base and with the lack of factories, he had a hard time securing a fourth base. Eventually SarenS succumbed to the restless Protoss agression. The second game on Tau Cross kicked off with a more agressive gateway opening from Eriador. The initial zealots forced HayprO to cancel his third hatchery and deal with the early zealots in his base. The Swede dealt with the early harass including a pylon block in the natural choke quite handily, but Eriador wasn't by any means all-in as he has meanwhile progressed with a delayed forge expand. HayprO decided to answer this with hydra-ling production off of his two hatcheries. Only learning about the Protoss wall upon his arrival, he had to rely on his hydralisk speed upgrade but he sucessfully dealt with the cannon and zealots and just barely stopped the forge from finishing the +1 weapon upgrade. Losing quite a lot in the process and floating minerals from drone oversaturation, the Zerg didn't try to break the emergency cannon wall. A good call considering the DT threat was now in play as well and with overlords nowhere in sight, HayprO had to focus on the defence, although not before forcing a huge investment in the form of seven cannons. With a decent hydralisk count, the Zerg didn't have to bother getting a spire and focused solely on his hydralisk production and upgrades. Eriador had no interest in air warfare either, warping up to six gateways and setting up to take a third base with two forges spinning to pump out a deadly army. 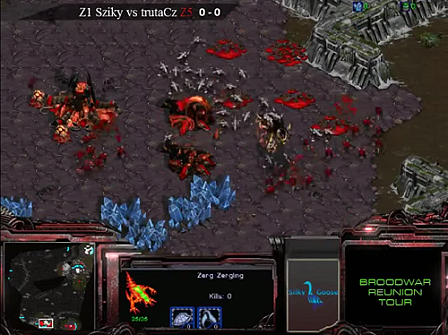 The third Protoss base went up uncontested and with three evolution chambers and three well saturated bases and a fourth one coming for the Zerg, it was Eriador's turn to get out on the map. With a decent supply lead and six high templars sitting at full energy for the Protoss player, this seemed like a good idea but it turned into a disaster as Eriador's army was surrounded by lurkers supported by hydra-ling, and despite some decent storms, soon perished. Realizing the Zerg was gaining the upper hand, Eriador decided to take step back and try to claim a fourth base in the top main. Even though a well timed ling runby got past his defences and sniped the warping nexus, his engagement in the middle of the map went much better, putting him in a 40 supply lead over HayprO, who was greedy enough to claim a fifth base at the three o'clock. Rather than clinging to the idea of a fast fourth base, Eriador decided to take advantage of his favorable engagement and put the pressure on the Zerg with a reaver assault of the third base. This worked out so well for the Norwegian that he could immediately follow it up by ravaging the Zerg's fifth base meeting zero resistance. 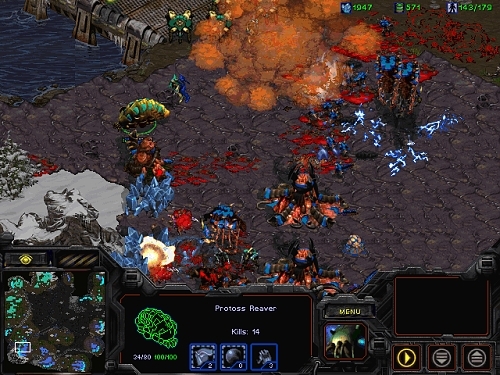 The dragoon heavy army soon fell to plague though and with the first ultralisks out for HayprO, securing a fourth base still proved to be an issue. Eriador let the enemy burn his army away on his two reavers while his main force denied the fifth Zerg base reconstruction and this time even wiped out the fourth base as well, putting HayprO on just a single mining base. Just a single mining base is still better than no income at all though, which was exactly what Eriador had to work with. He pulled his archon heavy army back to at least secure the mineral-only base at twelve o'clock. 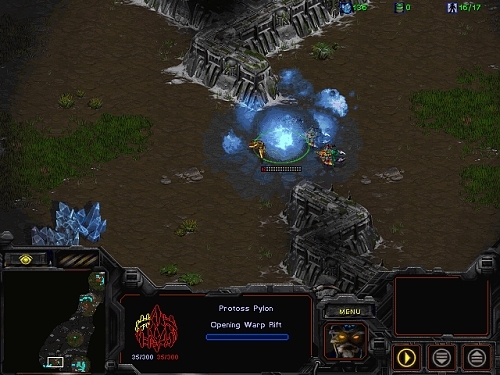 The back-and-forth low eco lategame was eventually decided by two consecutive lurker drops at the mineral only, securing HayprO dozens of probe kills and the semifinals. 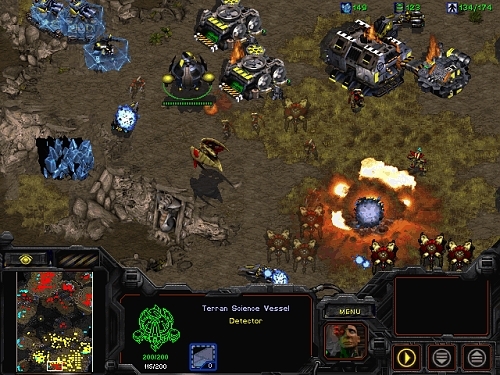 In the second set, TT1, spawning in the top right base on Tau Cross, decided to dictate the flow of the game by pylon-blocking Fosken's natural choke, forcing the Zerg to build an in-base hatchery at the bottom main. Although Fosken survived the early zealot harass, TT1's zealot/archon attack decimated his fragile lurker count which combined with weak static defences lead to the inevitable GG. While many viewers were excited to enjoy the tournament for some of that sweet nostalgia, the players, while rusty, still provided us with entertaining games. All of the semifinal contestants showed smart play and clever mind games and with big money on the line, some dirtiness was to be expected as well. In the first game of the semifinals, both players spawned in close air positions on Python - ClouD in white at the two o'clock main and TT1 in yellow at the twelve o'clock. TT1 opened with two gateways for zealots that he ended up using just defensively, switching into tech. Meanwhile, ClouD had the tech advantage with a gate-core built and added two more gateways looking to perhaps make something happen with his earlier dragoon range. The highground advantage of the ramp and three zealots for the Canadian was enough to stop any such attempts though and with goon range finished for both players, TT1 prepared to take his natural expansion. In the enemy camp, ClouD had no such thoughts, investing his resources into robotics tech. With TT1 further delaying his reavers by going observer first, all ClouD had to at this point was issue his dragoons to a-move into the enemy natural and drop his two reavers safely. He did even better than that and easily cleaned up TT1's natural along with most of the army, forcing the GG. The second game saw ClouD spawn green at the top right and TT1 peach at the left main on Tau Cross. Besides a skipped zealot for ClouD and hence a slightly faster second gateway, both players followed the same three gate goon range build. TT1 got a faster robotics for obs though, and he still decided to poke into ClouD's natural, where he fell into the Italian's trap. Unaware of the dragoons positioned in the fog of war to the left, TT1's killer instincts kicked in as he marched in to punish the out-numbered dragoons of his adversary, only to find his forces surrounded. Losing only two dragoons and a zealot was as good an outcome as he could have hoped for. With the supply lead, ClouD pursued the retreating dragoons all the way to TT1's main, getting past the choke point but facing the home re-inforcement advantage and losing his main force and the battle. With the game even, both players decided to delay their expansions and get reavers out. While ClouD was playing in the dark, TT1's observer in ClouD's main followed his every move and was ready for the two reaver assault. TT1 made up for his missing shuttle by sniping ClouD's right away and picking off the exposed reavers, forcing ClouD to retreat. Despite the failed attack, ClouD felt comfortable enough to take his own expansion while TT1 hesitated and eventually decided to go on the offensive with his own two reavers. The two reavers were not enough to overcome the huge arch ClouD set up in front of his natural though, and with his entire army wiped out and no expansion to fall back on, TT1 called the GG. Spawning in close ground positions on Python, MaNa risked forge fast expanding. HayprO got early zergling speed just to deny scouting and progressed with a three hatch hydralisk agression. Even though MaNa may have picked up on this fact, going citadel before stargate, he couldn't scout with his probes. Caught with his pants off and no emergency cannons warping or even probes pulled, MaNa was completely rolled over by HayprO's hydra-ling bust. In the second game, MaNa spawned top and opened with a standard FFE, cannon first for safety. Seeing a probe at his natural, HayprO didn't even bother trying and went straight into the third base to lay down his hatchery, opening with pool first and six initial zerglings. These six zerglings ran unchallenged past the Protoss wall into MaNa's main base, securing an economic advantage for the Zerg by constantly harassing the probe line. MaNa decided to add some reavers to his +1 sairs against HayprO's +1 carapace mutalisks. The unfavorable situation for the Zerg was somewhat made up for by a nice scourge interception that cost MaNa two of his corsairs. HayprO then wanted to get rid of the corsairs altogether and claim air dominance but MaNa smartly only moved out just seconds before his +1 air weapons finished, turning a successful surround into a complete disaster for the Zerg with all of the mutalisks melting. The first army engagement started well with some nice storms from the Protoss but ended in a surround that decimated the Protoss army. MaNa still secured and managed to hold a third base at the ten o'clock and a mineral only at the top right, but getting a fifth base of his own, HayprO still had the upper hand and began setting up a lurker contain at MaNa's front and on the highground of the mineral only as well. 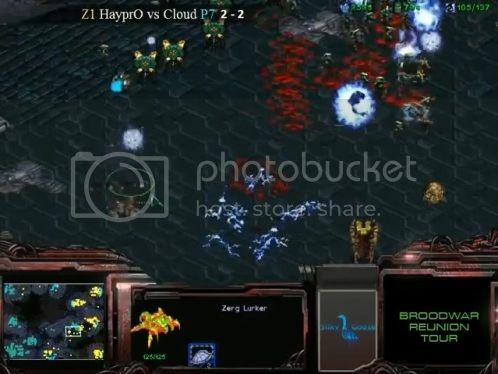 MaNa's patience somewhat payed off as he baited some favorable engagements from the Zerg but as his third base fell, HayprO's six bases and heavy tech was too much for him to fight and swarming over the Protoss natural with cracklings and ultralisks supported by dark swarm, HayprO advanced to the finals in a dominant fashion. With the semifinals finished, the two finalists have been confirmed: HayprO and ClouD. The finals was a best of 5 played on the four maps of Bluestorm, Destination, Python and Tau Cross. Game 1 (Bluestorm): ClouD opened with a forge FE against Haypro's pool first build. Haypro got zergling speed and tried for a runby using an OL to tank shots but a tight forge and probe blocks kept ClouD safe. He then decided to double expand and went for lair as ClouD established his expansion. After starting his lair, Haypro canceled it adding a hydra den for 3 hatch hydra however this is scouted by ClouD who built a ton of cannons. Haypro decided not to attack and instead went for lair and drops. ClouD went on to establish his third while Haypro grabbed a fourth. A 3 OL drop from Haypro took down ClouD's main nexus and some gateways as well as many probes. ClouD decided to attack uphill but couldn't break through Haypro's army (pic). While this battle took place, ClouD took his 4th and eventually cleaned up the drop to try and re-establish his main as Haypro took a fifth. ClouD tried to attack again but was overwhelmed and pulled back to establish a fifth base. At this point, Haypro is up in supply and pushed ClouD's army back to his fourth. Another 4 OL drop with cracklings managed to clean up a lot of ClouD's main to secure Haypro the win! Game 2 (Destination): ClouD went for the usual forge FE as Haypro opened pool first. Haypro double expanded soon after and used some zerglings to keep ClouD busy. Some good zealots net ClouD some drone kills as both players macro up with Haypro getting both a spire and a hydra den while ClouD went for a stargate. Both players kept massing up as Haypro grabbed a 4th and 5th while ClouD took a 3rd. After a large engagement in the middle of the map which Cloud won convincingly, Haypro gg'd to give Cloud the win. Game 3 (Python): Deciding to change things up, ClouD opened with a gateway to Haypro's pool first into expansion build. He added a stargate and a templar achive soon after going dts while expanding. Haypro went for lair, got OL speed and hydras speed then started massing hydras. Right before he attacked into ClouD's expansion, ClouD withdrew some units into the main leaving him with only 2 cannons and 2 hts to defend. With some splits, Haypro easily took down the expansion to go up 2-1 in the series. Game 4 (Tau Cross): The game started with Haypro going pool first into expansion to ClouD's Forge FE. After seeing ClouD expanded, Haypro went for a third hatch, took his gas and eventually teched to lair. He added a spire soon after and then a hydra den at his natural. In the meantime, ClouD added more gates and a templar archives while getting +1 attack with 5 cannons in his mineral lines for muta defense. ClouD then decided to take a third however a large hydra force managed to take it down and destroy his army leaving him clinging to life. Things got grimmer as ClouD's nexus at his natural also went down leaving him mining from one base to Haypro's three base. ClouD managed to hold on (pic) and using some storms, pushed back Haypro's forces re-establishing his natural. At this point, Haypro started overcommitting and was pushed back going down further in supply. As ClouD massed up a big army, he took his third again and fought Haypro's army near the bridge taking it down to take the game and tie the series 2-2. Game 5 (Blue Storm): With the final game on hand, both players opted for the same build as the first game. Haypro made a lot of speedling looking for an opportunity to have a runby but seeing as the expansion was well defended, he decided to double expand instead taking his third at the gas base in the bottom right. He then morphed a lair soon after adding more hatcheries, a spire and a hydra den. On the other hand, ClouD got his citadel, +1 attack and added more gates. Seeing Haypro being defensive, he took a third base and went for a speedlot attack on Haypro's third which was easily deflected as Haypro decided to go for mutalisks. It was too late though as ClouD was ready with lots of cannons, storms and archons. Haypro then took his mineral only as his 4th though a bad mistake on his part saw his mutalisk count fall down to 4 after running into archons. With a lot of gates, ClouD macroed up one big army going up 50 supply over Haypro and decided to double expand as he zoned out limiting Haypro to only 4 bases. 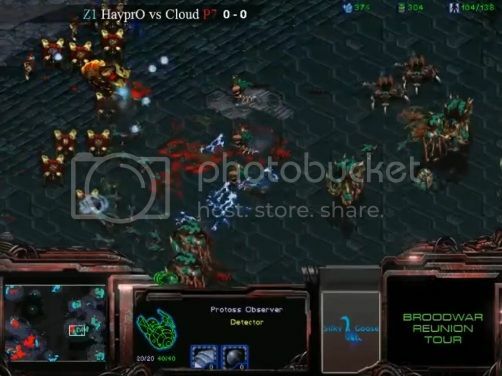 After several failed attempts by Haypro to take down ClouD's 4th base, ClouD eventually attacked into Haypro's lurker field and with the army advantage, easily took out his army to win the game and the finals, 3-2. With that, ClouD became the first ever BW Reunion winner! Congratulations to ClouD for first place and to Haypro for a well fought series. ClouD's tough road saw him beating Mondragon 2-0 in the quarterfinals, TT1 2-0 in the semifinals before dispatching Haypro 3-2 to win $600 and first place! Eri vs Mana was a really nice game apart from some mistakes in the end. The last big engagement in the middle can easily be nominated for the worst engagement. Mana's storms were top notch. At one point, Ptak's overlords are all stacked and ClouD proceeds to kill every single of them, leaving Ptak with an 83/5 supply. SarenS keeps choosing horrible places to engage. Arcneon vs Socke, PvP@Python, close air positions. Arcneon tries to escape his shuttle from Socke's base. As the shuttle is about to die, he unloads the reaver, so the reaver is stuck on this island. Game chat: "Arcneon: whaaaaaaaaat?!" A minute later, the exact same thing happens to Socke after he tried to drop Arcneon's min line! So each player has his reaver stuck on the island. Reavers crawl towards each other, each shoot a scarab, and they both die at the same second! Thanks to BigFan, endy, Artanis[Xp], Hyde and 2Pacalypse- for their help and input. A special double thanks of course to Artanis[Xp], Kaoru, Raistlin, Retuh, chrisolo and aLc.Myu, as well as all players for making the tournament happen! This was a truly fun event. Can't wait for a repeat this year. Nice writeup, Event was great. Szisky is imba. Nice recap, the tournament itself while good wasn't the highlight from my own perspective. I thought the best part was just the days leading up to it with everyone hanging out on ICCup and all the play/ob games happening at the time. Getting to play Vulture Micro with Mondragon, a practice game with Sen, these things it made ICCup feel more alive than it had in ages. I am pretty sure Sziky misunderstood the handicap business several times and played that last ZvZ vs truc the way he did because he thought he had to follow a no muta handicap despite Truc not being an oldschooler, but maybe I'm wrong and he'll clarify it! All hail BW and may 2015 be a good year for zerg! lol gj cloud... u so bad. Sziky too good, we need to send him to Afreeca. whats sziky win record against ex-pros on fish?